While the politics in the Summerset Isles may not be a monarchy, there was certainly a chain. More of an oligarchy. My older brother, Alinius, was the direct heir to my parents mini ‘empire’. He was undoubtedly being groomed for the role. As second eldest, it would have all fallen to me, if something happened to my brother. Except…I was less than the perfect daughter. My brother was always the favored. Handsome, charming, smart, and athletic, especially by Altmer standards. Perfect, in almost every way. The pride of the Letholias family. I, on the other hand, was a disappointment. I always got the feeling I was just the ‘insurance policy’, in case something happened to Alinius. But I did not exactly fall into the mold my parents would have preferred. No, in fact, I pretty much opposed everything they stood for. My family were the darlings of the Thalmor. I was an outspoken opponent. I got in particular trouble one year when I wrote an essay calling the Thalmor’s systemic brutalization of other cultures a type of ‘ethnic cleansing’. My horrified parents apologized to the Dean of my school, assuring her it would never happen again. Soon after, I was withdrawn from school, and given a private instructor. Running away probably caused my parent great embarrassment. Being returned ‘dead’, I hate to say, was probably a great relief. My heresy would trouble them no more. If there was anyone with whom I missed in my family, it was my brother. I probably should harbor resentment because he was clearly the favored child. I did not. I idolized him. I thought he was as perfect as everyone else. I was his little sister. He defended me against my parents, and others, on numerous occasions. I wished he could have come with me. Enough with the laments in the past, and the daydreams of fools. 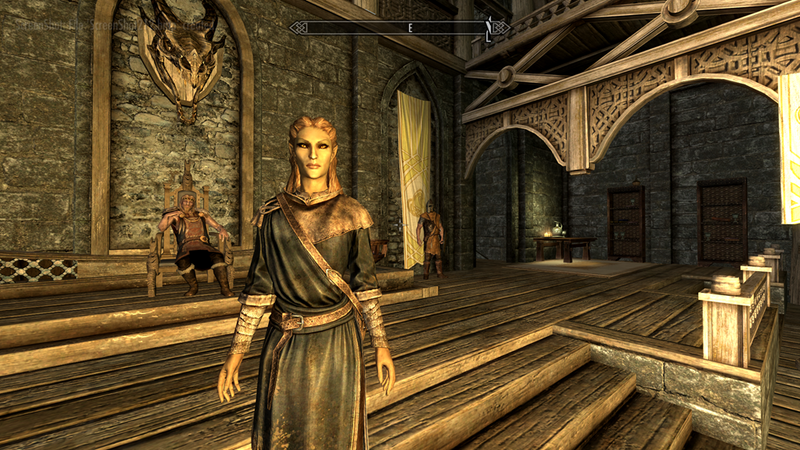 I rose from bed and made my way back to the Jarl. I informed him that the dragon was dead…and I absorbed the soul of a dragon. He listened with great interest, and told me a bit more about the Nordic legends. He said I must make my way up 7000 steps to the Greybeards atop Mt. 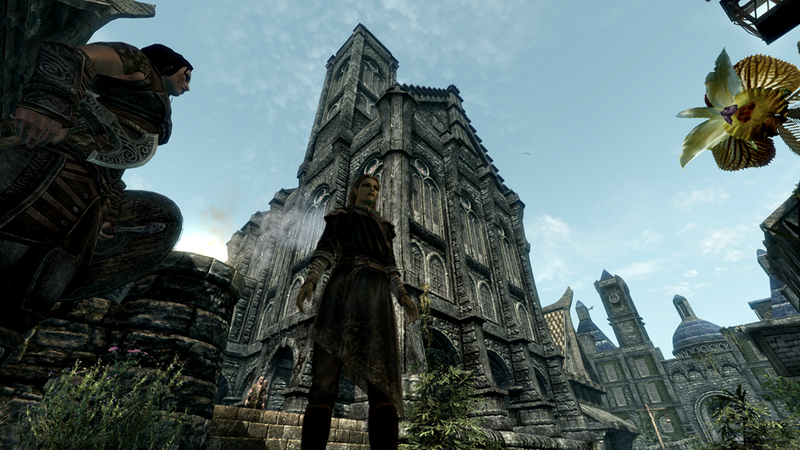 High Hrothgar. 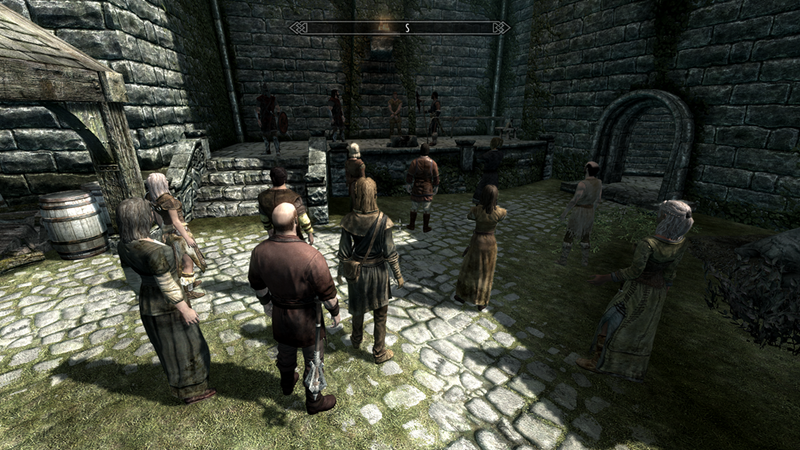 He said they were summoning the dragonborn to come. Summoning…me. A daunting and perilous journey, it seemed. Though grown in power, I sensed I was not yet strong enough to make the journey. As a parting gift for my part in protecting Whiterun against the dragon, he decreed me Thane. 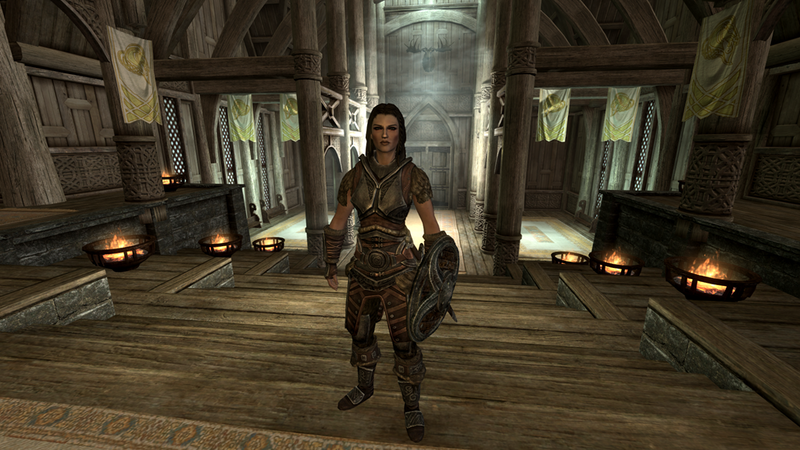 A housecarl named Lydia became my guardian and servant. The customs of the Nords were still new to me. Honored and humbled, I thanked him. I did not expect this. 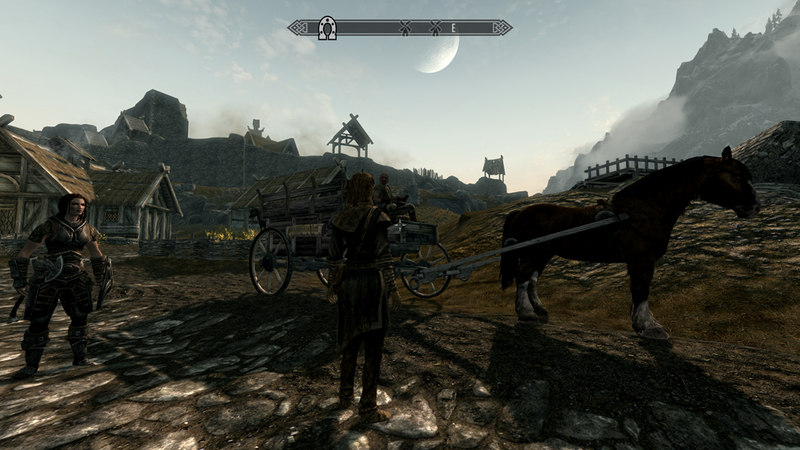 Skyrim, though ruled primarily by a class of nobles, there did seem to be a minor system of meritocracy. I was born into a type of diplomatic nobility, and I was used to having guard detail around me. I hated it in the Summerset Isles, but mostly it was because my parents used the guards to spy on me. And keep me from causing them trouble. Here, I was the one in charge. Lydia took orders…from me. Not my parents. I agreed to Lydia’s service. If nothing else, I was glad for the company. She was pleasant enough, and hardworking. Except when I asked her to carry something for me. 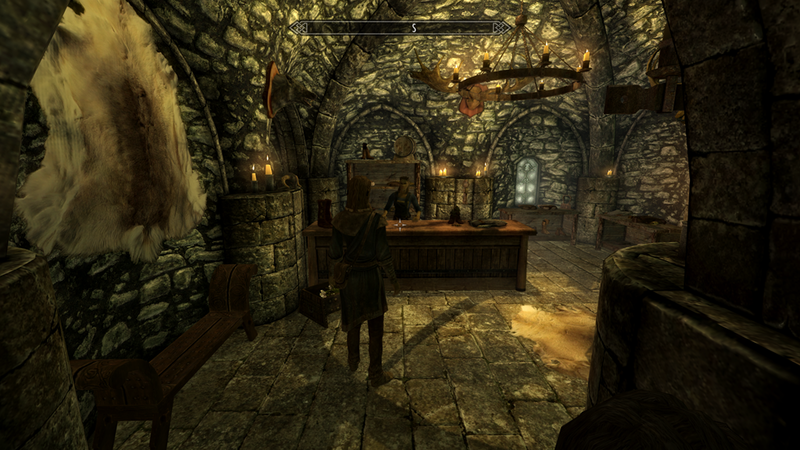 I was particularly baffled by her attitude when I offered her the Axe of Whiterun the Jarl had given me. I thought she could make better use of it than I. Despite her grumblings, I saw she equipped it immediately. Well, I’m glad my gift would be used, if not outwardly appreciated. 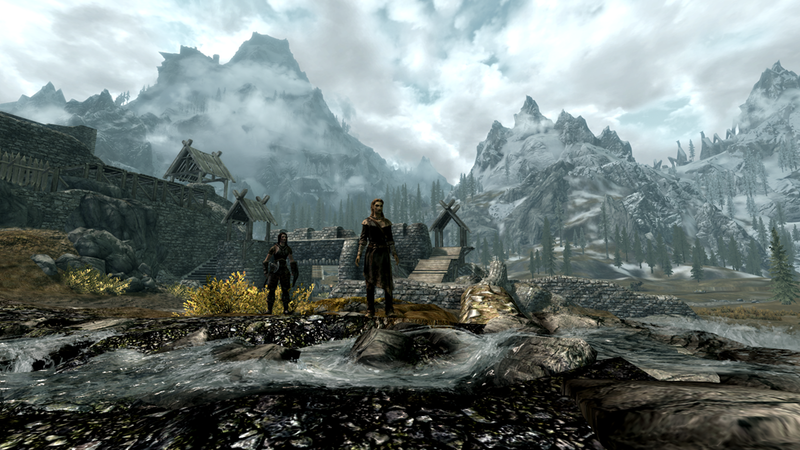 I took Lydia with me to explore the wilds around Whiterun. 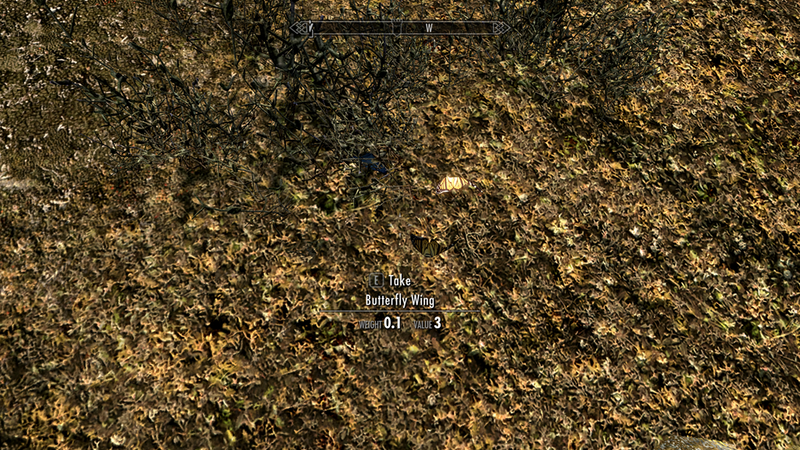 At one point, I stopped to admire butterflies…and accidentally used the power of the dragon shout. It shattered the butterflies to pieces. Lydia and I were both stunned. Well…I hate to say it, but it was easier than chasing them. The wings have quite useful alchemical properties. I harvested their wings for experimentation. Their death would not be in vain, I promised. I would further pulverize their little wings into a very useful poultice. I pondered my epithet one day. “Here lies Azeriah, who used the infinite, all-mighty, ancient power of dragons to shred the wings off butterflies”. With my new companion in tow, it was time to finally visit Solitude. We took coach. Upon entering the city, I was greeted to a grim spectacle. A man was being beheaded. I went into a cold sweat. Memories of my head on the chopping block, and the nightmare, still all too fresh. When the spectacle was over, I grimly searched the man’s body. He wore an amulet of Talos. Despite the Talos worship ban, Nords were clearly holding to tradition. The Nords should be able to worship whom they choose. A false god or not, it is their choice. The Thalmor had no right to force them otherwise. To be honest, I doubted the Thalmor cared about it, truly. I believed it was a ploy to incite rebellion, which is precisely what happened. My viewpoint embarrassed my family. At least they stopped forcing me to attend their insipid parties, for fear I would spew this heresy in front of their important friends. I read my books in my room instead, quite happily. Though I did miss the tea and cakes. I discovered a clothing store named “Radiant Raiment”, and hurried inside. I was dying for a proper pair of shoes. I still had the wretched foot wraps from my imprisonment. The high elf owners reminded me of home, and not in a good way. I recalled their sort well enough. Pompous, and overinflated sense of self worth. Back in the Summerset Isles where my family name held weight, they at least held their snide remarks in check. Here, there were no filters. I got the same treatment that every ‘nobody’ gets. High elf in blood, but that was the only commonality we shared. At least I finally had a decent pair of shoes. Delighted with my new chasseurs, I sauntered down the highstreet to the Bard’s college. I’ve nearly realized the first steps of going to college. This was my original destination when I set off to Skyrim a month ago. I nearly got my head chopped off, and escaped a dragon razing a city. I lost my family, heritage, and identity to get here. There isn’t anywhere else I’d rather be.